Would you like world peace with that? For my Holocaust in History, Literature, and Film class taught by Professor Kevin Madigan, I decided to write my final paper on the behavioral analysis of Nazi propaganda. As someone who is deeply interested in Behavioral Economics on a professional level, Nazi propaganda is a dark and fascinating topic. To understand the origins of Nazi propaganda, it is important to know Germany after World War I, hit by economic recession and paying for reparations from war. Social & Attributional Biases: These are biases that affect our social perception and the means through which we determine who or what was responsible for a particular action or situation. Memory Biases: These are biases that can either enhance or impair the recollection of a memory, either near-term or long-term. Decision-Making Biases: These are biases that impair our ability to make rational decisions despite evidence to the contrary. This includes biases in probability and belief that impact decision-making. Given this, I came up with the key set of biases that they Nazis chose to trigger in the population, and came up with a framework to identify such propaganda should the public encounter it. You can find a copy of the paper here: Analysis of Nazi Propaganda: A Behavioral Study. 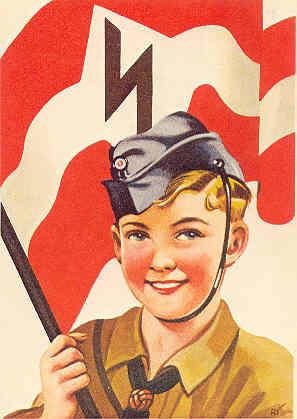 I deal with Third Reich militaria and i studied the nazi propaganda. Another characteristic is the nazis present themself as victims. E.g they didn’t want the war, the polish began, the same for the soviet, etc etc. The paper is nice. The even more interesting bit about the Nazi regime, I find, is the regime’s internal power struggles and Germany’s political economy. Awesome paper. It’s extremely interesting and seems fairly accurate. I find it odd however, that you’ve denoted an absence of the use of memory biases from employment in Nazi propaganda. From my understanding, all of these propaganda use the picture-superiority effect, and many use the levelling and sharpening, generation, spacing, and cryptomnesia effects. I must note that the only introduction I have to biases, aside from looking up memory biases, is from the short introduction to them in your paper.